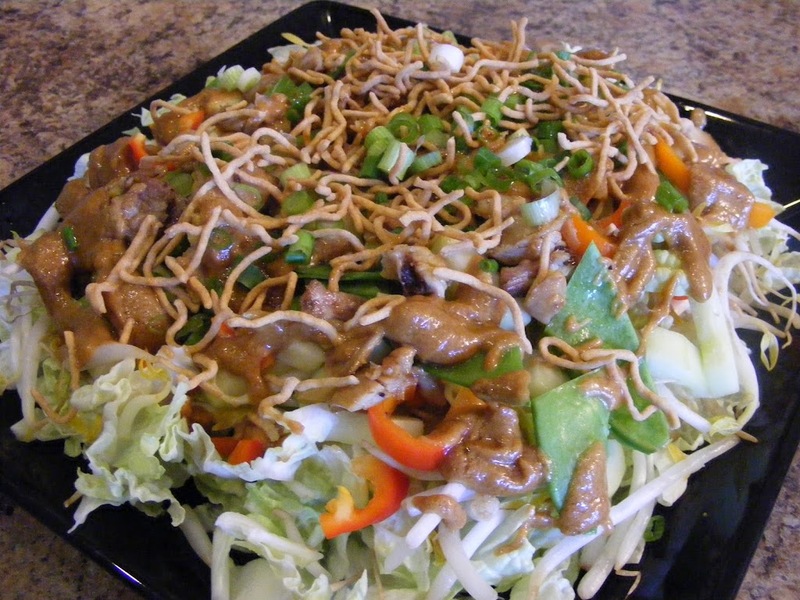 1 head (1.5 to 2 pounds) napa cabbage or green cabbage, cut into 2 by 1-inch pieces (reserve 2-3 large leaves, uncut). Note: You can also substitute bok choy in place of cabbage. 3 tablespoons Korean chile pepper flakes or paste (gochugaru). I used 1 tablespoon Sriracha sauce. For extra hotness: add 1 chili pepper (doesn’t need to be gochugaru). I used a dry Thai Birds-Eye pepper, shown in the foreground. Wash all vegetables and premeasure all of your ingredients so you have them ready to go. Set aside a few large cabbage leaves (to be used at the end of the process). Place the rest of the cabbage in the large bowl and sprinkle with 2 tablespoons of kosher salt. Toss to combine. Cover the large bowl and allow its contents to sit at room temperature until the cabbage has wilted (expect this to take a minimum of one hour and as many as 12). As it wilts, the cabbage will release around a 1/4-1/2 cup of liquid. 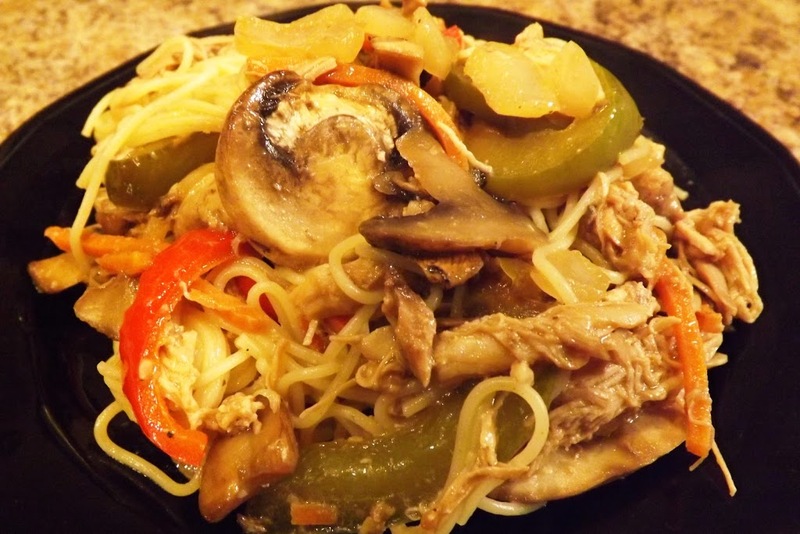 (To speed the process, place a plate on the cabbage and then put a weight on the plate. A gallon jug of water works perfectly.) Remember this could take as many as 12 hours, so give it time if it needs it! I think leaving it the full 12 hours under that plate created more juice and a better finished product. Once the cabbage has wilted, drain it, set the liquid aside,and pat the leaves dry. After you drained the cabbage, combine the garlic, ginger, chili pepper, carrots (if you’re using them), and sugar (or the apple or pear, if using) in the food processor or blender. Process the mixture until it forms a rough paste (around 30 seconds if using a food processor or blender). Be sure to scrape the container’s sides as needed. Thoroughly mix the cabbage with the paste. This is your basic kimchi mixture. 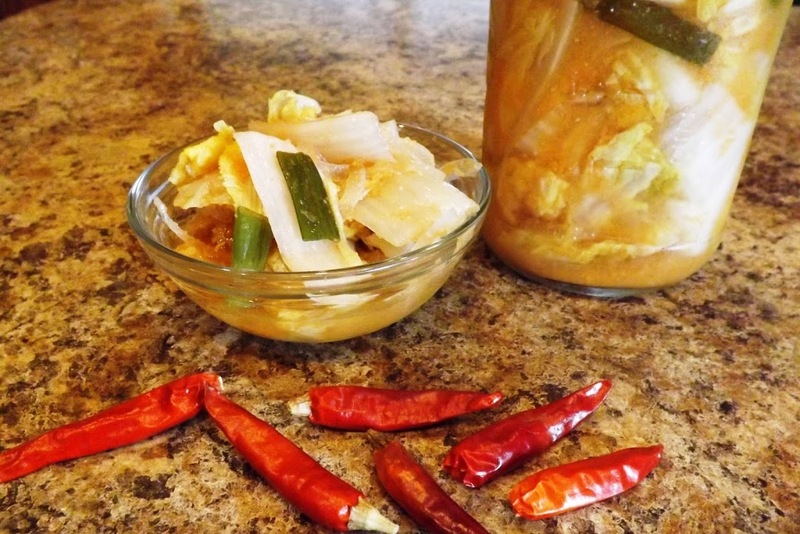 Pack the kimchi into the mason jars (try to avoid air pockets). Add equal amounts of the reserved cabbage liquid to each jar, making sure that each jar has at least an inch of head space (If needed, add some water to the jars to make sure the kimchi is completely covered by liquid.). Press the mixture down firmly using the wooden spoon, so that the brine covers the top. Cover the top of each jar with one of the reserved large cabbage leaves. When the kimchi is ready, remove the big cabbage leaves from the top of each jar and store the jars (tightly sealed) in the fridge. The kimchi should keep for several months. 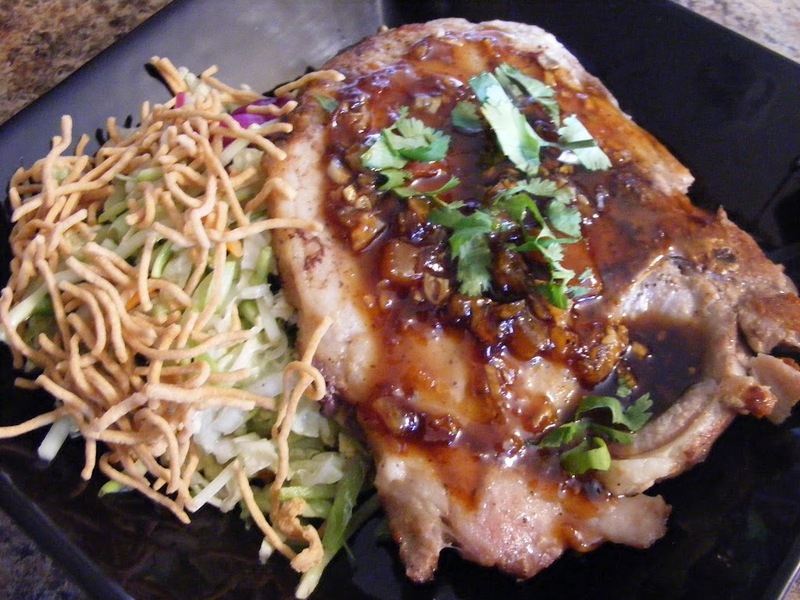 While the grill is preheating, sprinkle the Chinese Five Spice powder on the chicken. Spray one sheet of aluminum with cooking spray. Place 1/3 of the potatoes on the sheet. Add another 1/3 of the potatoes. Carefully bring the top and bottom edges of the foil together over the veggies and fold the edges together to seal. Then tightly roll the right and left edges. Place that packet on the second sheet of foil, seam side down, and repeat step 8. Note: I just saw that they now sell aluminum foil bags which would greatly simplify this part of the meal. Using tongs and a paper towel, wipe the vegetable oil on your freshly brushed grill to help prevent the chicken from sticking. Lay the chicken, skin side down, over the direct heat. Place the veggie packets near the chicken, on the edge of the hot and safe zones. Turn the chicken after 5 minutes, or if the flames of hell start to flare up. When both sides are browned (10-12 minutes) move the chicken to the safe zone. Let if cook, undisturbed, until it has an internal temperature of at least 165, but with legs and thighs, you can even go to 170 without drying the meat. This will take 30-4 minutes. If you don’t have a thermometer, use a meat fork or a skewer, and pierce the thigh in the deepest part. Pull it out. If the juices are red, it is still raw. If they are clear, it is done. Turn the potato packets 1/4 turn (flat, right edge, upside down, left edge, flat) every 10 minutes. Remove 40 minutes after putting on the grill. 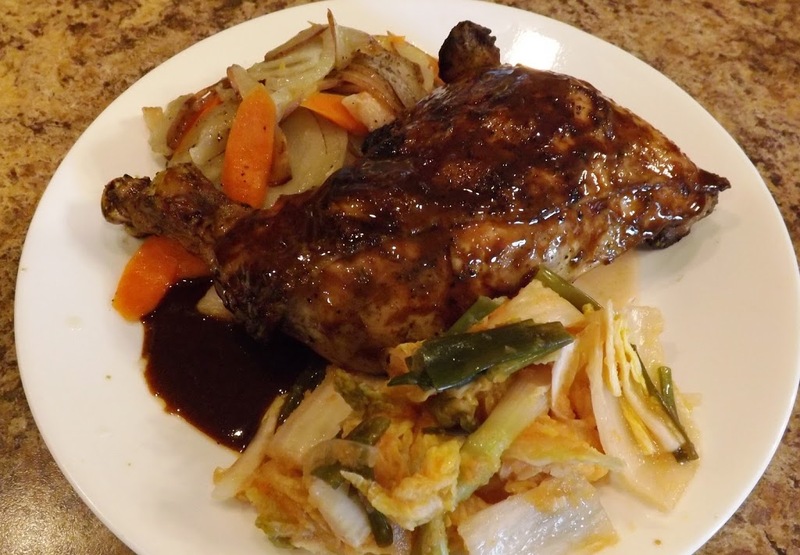 Remove the chicken when done and immediately brush the Hoisin BBQ sauce over it. I don’t brush this on while the chicken is still on the grill, because I don’t want it to burn, or all run off and fall into the grill. Let the veggie packets and chicken rest for 5 minutes, then serve. 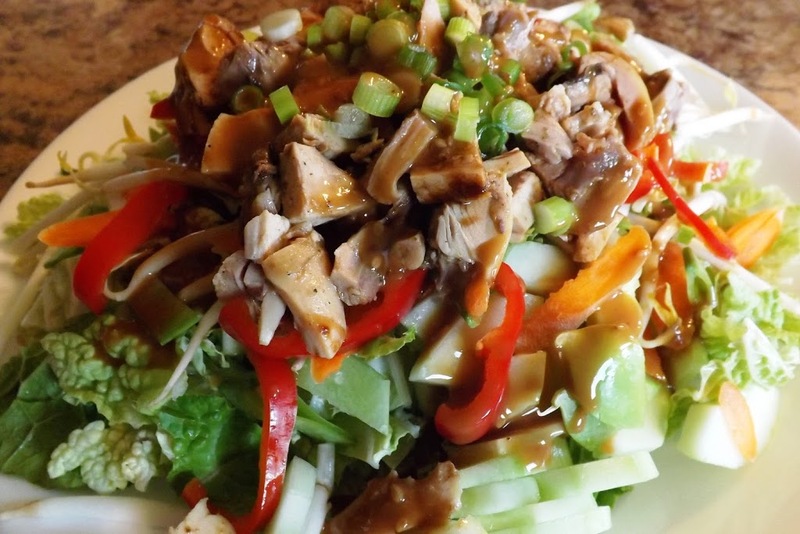 In the next couple days, I will show you how to make an Asian Chicken Salad, using the leftover chicken and Hoisin BBQ Sauce. Heat a non-stick skillet (10″) over medium-high heat. Add 1 tablespoon olive oil. Add remaining teaspoon olive oil to the pan. Add onions. Saute until the just begin to turn translucent. Turn heat to medium. Add mushrooms, and let them cook, undisturbed for 2-3 minutes. 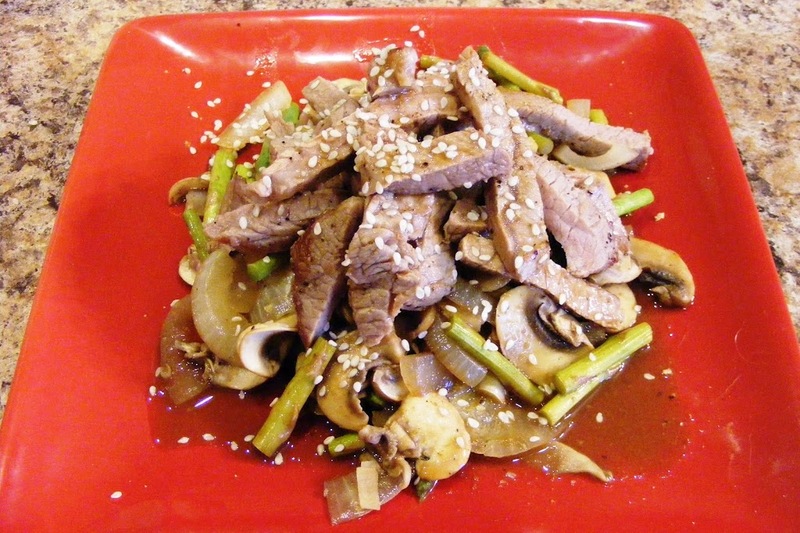 Stir onions and mushrooms together. Add garlic and ginger. Mix together. Meanwhile, heat broccoli in a microwave until hot and still crisp. 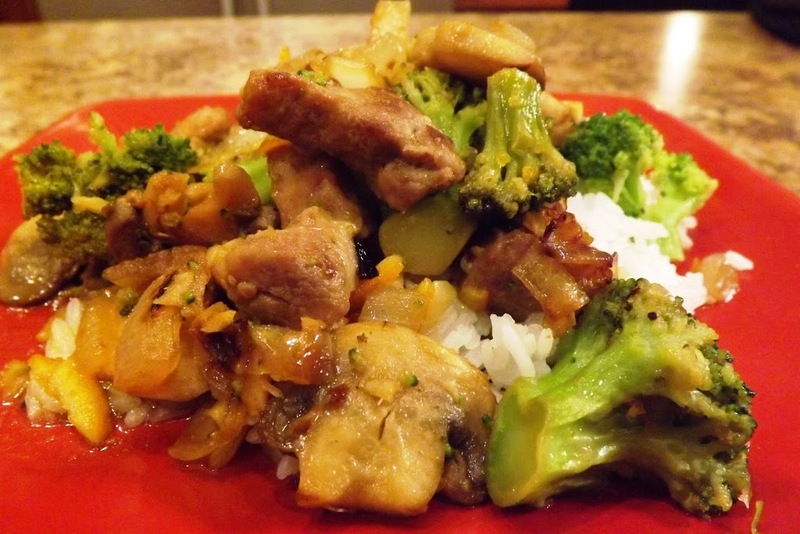 Add broccoli and pork to skillet. Pour sauce into skillet. Stir to coat. Serve when combined and hot. I made this with a pressure cooker. It cooks faster and creates tender meat. You could do this in the oven by roasting with same liquid, but it will take 2+ hours. In the pressure cooker, heat the oil. Season meat. Brown on both side. Remove the cooker, set aside. Add all remaining ingredients. Stir to dissolve. Add meat. Seal and cook 20 minutes according to your pressure cooker’s directions. After 20 minutes, let the pressure drop naturally. 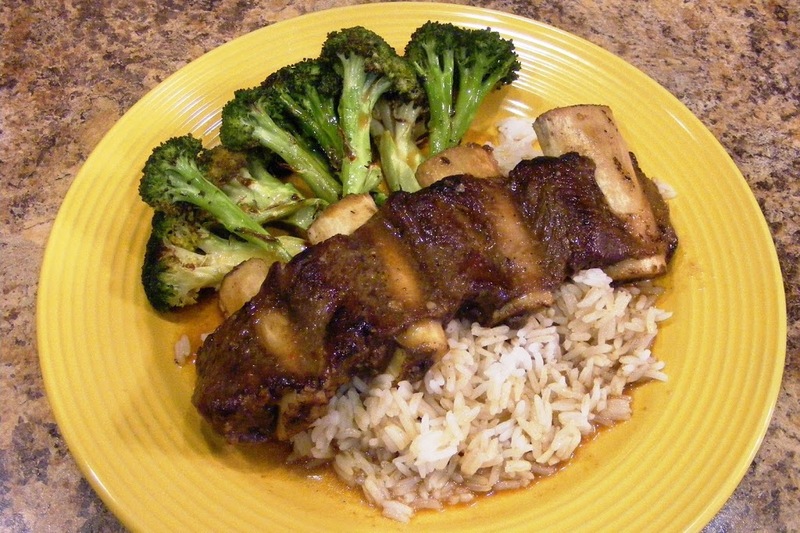 I served this with jasmine rice and sesame grilled broccoli. (I drizzled toasted sesame oil over broccoli spears and then grilled them over a hot grill until they were hot and beginning to get some dark brown color. Thaw thighs. Place in a Ziploc bag. Add all remaining ingredients. Place bag in fridge and let marinate for 1-2 hours. Turn occasionally. Heat non-stick skillet on med-high. Spray with cooking spray. Place thighs in pan. Pan-fry until brown and turn (4-5 minutes per side). With finished cooking remover from heat and keep warm. Combine all ingredients, bring to a boil. Loosen any brown bits (fond) stuck to the pan. Stir over med-high heat until the fluid is reduced to about 1/2 cup. 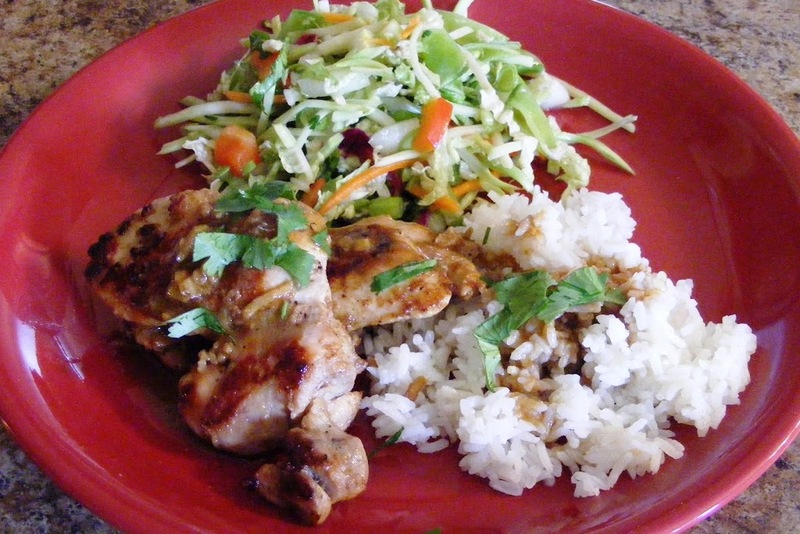 Serve one or two thighs on rice, with one tablespoon sauce. 1. Season the beef with salt and pepper to taste. Also use a touch of five spice powder. Set aside. 2. Heat a large non-stick skillet. Add 1 teaspoon sesame oil. 3. When hot, add onions. Saute for 2-3 minutes. 4. Add mushrooms and asparagus. Toss to mix. 5. Add water, vinegar and Hoisin sauce. Stir, turn heat to high and cover. 6. Heat a second non-stick skillet (11 inch). When hot, add the remaining sesame oil. 7. Pan fry steaks, about 2 minutes per side. 8. Turn the heat off the vegetables. They should be hot, but a bit crunchy. 9. Remove the steaks, and cut into strips, about 2 inches long and a 1/2 inch wide. 2. Heat a non-stick skillet over medium high heat, add the olive oil and place the pork chops in it. Cook until finished (3-4 minutes per side, depending on thickness.) You may need to cook them in two batches if your skillet is not large enough to hold them all. 3. Remove pork from heat and cover to keep warm. 5. Add remaining sesame oil, marmalade, vinegar, water and Hoisin sauce. Stir constantly until the mixture is combined and hot, about 2 minutes. 6. Serve about 2 tablespoons sauce over each chop.